Sir Mark Todd says he’s done everything he can to have He’s Eminent fit and ready for his Australian debut at Rosehill on Saturday and now it’s over to jockey James McDonald. Track rider Bruce Herd with He's Eminent at Canterbury. 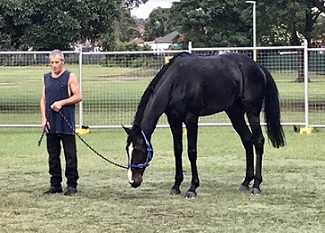 He’s Eminent has thrived at Canterbury since arriving earlier this month and as he watched the five-year-old cruise around the Polytrack on Thursday morning Todd admitted he doesn’t know what to expect on race day. “We’re going to learn a lot about him in this race,’’ Todd said. “He’s adapted to being here really well. He’s a very alert horse who seems to cope with everything that goes on around him. The best of He’s Eminent was seen in mid-2017 when he led all the way and easily accounted for Avilius in a Group 2 over 2000m at Deauville in France and was placed in the Group 1 Irish Champion Stakes. As it happens, Avilius will be favourite in the Group 1 $700,000 Ranvet Stakes (2000m) at Rosehill while TAB is keeping He’s Eminent safe at $8. Todd said he’ll leave tactics up to James McDonald but expects to see the entire rolling somewhere up on the speed and any improvement in the track condition would be of benefit. The horse hasn't done any barrier practice while in Sydney but has no history of being a problem in the gates. “There doesn’t seem to be a lot of horses that like to lead,’’ he said. “He can pretty much do anything, he can sit in behind or lead and I’m just going to leave it up to James McDonald. If He’s Eminent performs as well as he’s been working then he’ll likely take his place in the Group 1 $4m Longines Queen Elizabeth Stakes (2000m) at Randwick on April 13. Todd has been using all the expertise that has taken him to seven Olympic Games as an eventer to rejuvenate He’s Eminent after the horse was retired last year. He believes it has done the trick but the big test will come on Saturday. “When we first got him the idea wasn’t that he was going to come back to racing and I treated him like one of our other horses,’’ he said. “At our property we can go out on the ridgeway and hack for miles, do some flat work and jumping exercises and that’s helped him mentally and physically. “He learned to be a normal horse. When it was decided to send him racing we changed the work a bit. As for the 2020 Tokyo Olympic Games, Todd isn’t ruling it in or out just yet but said he does have a couple of horses of Olympic standard if he decides to have another shot.